A group of Muslims have started their own poppy appeal at a London mosque that acted as a bomb shelter during World War II. Working alongside the Royal British Legion, the London-based Ahmadiyya Muslim Youth Association has sold poppies in the capital before, but this year its campaign is being rolled out nationwide. Members are posting more than 100 volunteers at Tube stations and rail stations across the UK to try to surpass the £20,000 they raised in their 2011 appeal. It is a marked contrast to the coverage of Islamic extremists burning poppies on Armistice Day in 2010. Ann Bedford, from the Royal British Legion, said it was “really great” to have the support of the organisation. “The Ahmadis have supported us for three years and this support has grown each year,” she said. These “difficulties” come largely in the form of some members of the wider Muslim community. The youth organisation has faced opposition from those who object to British troops’ activities and question why a Muslim group is supporting a country whose armed forces are engaged in wars in Muslim majority countries. In 2011, the extremist group Muslims Against Crusades burned poppies on Remembrance Day and chanted “British soldiers burn in hell”. Some poppy sellers in the north of England are using security this year because of previous hostility to their work. Farooq Aftab, Ahmadiyya Youth spokesman, argues that these people are misguided. He said: “A few people might get the wrong end of the stick; the poppy is not about supporting the war, we want to show solidarity with our troops who are not policy makers. The group cites historical connections with the UK armed forces as another reason it is keen to be involved. 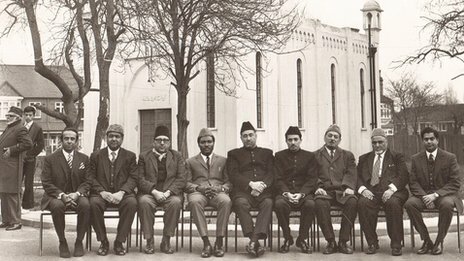 Ahmadi Muslims fought alongside British soldiers in both world wars, while the Fazl Mosque in Southfields, south-west London, which was inaugurated in 1926, was used as a bomb shelter in World War II, providing refuge for local English residents. Also known as the London Mosque, it is hosting the launch of the appeal. Tariq Ahmed, one of the people co-ordinating the poppy sellers, told BBC Asian Network there was room for a more nuanced view of the relationship between British Muslims and the British armed forces – that you do not have to support all military activity to support the troops. “I might be against the war in Iraq, but that doesn’t mean I’m not prepared to support the armed forces who protect our rights and country and fight against fascism,” he said. Ahmadis in the UK have often engaged in charity work to display loyalty to their host country. The Ahmadiyya community is persecuted in places including Pakistan and followers have also faced hostility here. In 1974 the Pakistani government declared the sect non-Muslim because of theological differences with mainstream Islam. Mr Ahmed said what he was doing was a duty. “It’s important for Muslims to be an integral part of society and contribute,” he said. “This was the example set by the Prophet Muhammad. Share the post "Ahmadiyya Muslim Youth Association starts poppy appeal"